In the recent issue of Moscow Defense Brief magazine the article by Mikhail Barabanov "Zapad-2017 Strategic Drills" was published. Bmpd presents its contents. The Zapad 2017 strategic military drills have been one of the most important events of the year for the Russian Armed Forces, along with the ongoing campaign in Syria. As such, they came under close international scrutiny. Russia holds the Zapad drills along its western borders once every four years; the previous such event took place in 2013. This year, however, the reaction from some of Russia’s neighbors to the west has been nothing short of hysterical. The obvious explanation is the general deterioration in Russian-Western relations since 2014. Long before the drills kicked off, the West launched an aggressive propaganda campaign about the alleged “Russian threat”. That campaign must have affected the Russian leadership, who changed their usual tack and tried to play down the scale and the military-political significance of the event. There was much less of an emphasis in the pro-government Russian media on the anti-NATO nature of the Zapad exercise in 2017 than in 2013. The greatest controversy in 2017 was probably about the numbers of the Russian forces and hardware involved. In their effort to demonize Zapad 2017, Western observers began to insist long before the event that up to 100,000 simultaneously deployed Russian troops would take part. Official Russian sources, meanwhile, tried to play down the scale of the drills, and to portray them as little more than joint Russian-Belarusian maneuvers in Belarusian territory. 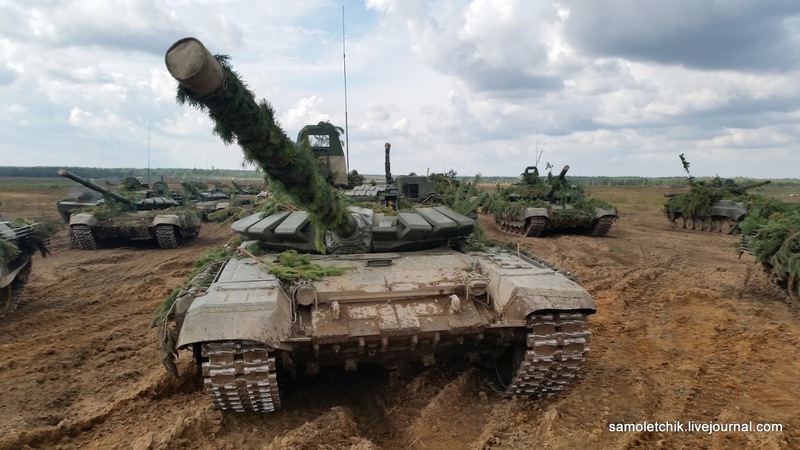 According to official reports, the main phase of the exercise involved 12,700 servicemen, of which 10,200 were deployed in Belarus (including 7,200 Belarusian troops and 3,000 Russian servicemen brought in from Russia specially for the drills). The amount of hardware involved was stated as 690 armored vehicles and artillery systems, plus 70 planes and helicopters. The scenario of the main phase was based on a conflict between the North (Russia and Belarus) and the West (the fictional states of Veyshnoria, Lubenia, and Vesbaria). The main goal under that scenario was to defend the sovereignty of the Union State of Russia and Belarus. Under the Zapad 2017 scenario, “The West” fomented an armed separatist movement in Veyshnoria (a fictional state in the western part of Belarus) and encouraged it to secede from the Union State of Russia and Belarus. During the first stage of the main phase, held in Belarusian territory, allied troops contained Veyshnorian rebels, put an end to their subversive activities, and then destroyed them. They also reinforced the border of the Union State using troops of the Special Operations Forces and other branches of the Armed Forces. As part of the second stage of the drills, the armed forces of neighboring Lubenia and Vesbaria invaded Veyshnoria to provide armed support to the separatists. In response, the Russian and Belarusian forces mounted a joint defensive maneuver and then launched an offensive, crushing the enemy on land, in the air, and at sea. There was also a focus on the use of modern command and control systems. The communications units involved in the drills rapidly deployed new communication lines and nodes, and equipped field command and control stations. The drills also tested the effectiveness of the Russian Armed Forces’ high-speed, multi-mode data network. Russia’s 2nd Guard Taman Motor Rifle Division, 4th Guard Kantemirov Tank Division, and 6th Independent Tank Brigade (all three units are part of the 1st Guard Tank Army) each contributed a battalion tactical group. Additionally, the 76th Guard Airborne Assault Division (Pskov), the 98th Guard Airborne Assault Division (Ivanovo), and the 106th Guard Airborne Assault Division (Tula) of the Airborne Assault Troops (the VDV service) also contributed a battalion tactical group apiece. Furthermore, the drills involved several missile brigades and units of the Aerospace Forces and Air Defense Troops assigned to the Western Military District (including two combat plane squadrons), as well as several engineers, transport, and psy-ops support units. The Baltic Fleet’s contribution included land units of its 11th Army Corps stationed in Kaliningrad Region. Finally, troops and hardware were contributed by the Russian Guard, the Interior Ministry, and the Emergencies Ministry. The Belarusian parts of the Zapad 2017 were hosted at six firing ranges: Lepelsky, Borisovsky, Losvido, Osipovichsky, the Ruzhansky Air Force and Air Defense range, and the Domanovksy range, plus an isolated area near the town of Dretun. The Russian part was hosted by the Luzhsky range (Leningrad Region), Strugi Krasnye (Pskov Region), and Pravdinsky (Kaliningrad Region). For all the Western concerns, the scenario of the main phase of the drills was purely defensive, and focused on defending an allied state (Belarus) from hostile actions and then a direct invasion by the West. In that sense, the scenario was fully in line with the Putin administration’s perception of the domestic and external threats facing Russia. The exercise was a fairly typical reflection of how Russia believes it should act in the former Soviet republics to protect its “sphere of interests” from any encroachment by foreigners. It did not imply any major military operations beyond the borders of the former Soviet Union. As with the famous “Gerasimov Doctrine” (which reflects Russian views of how the West operates, but which Western commentators choose to interpret as Russia’s own preferred course of action), the West 2017 drills were not a simulation of a Russian act of aggression. Rather, they reflected the growing concern in the Russian military-political leadership about increasingly blatant Western meddling in former Soviet republics. Another important event timed to coincide with Zapad 2017 was a series of separate drills, exercises, and combat readiness inspections of several Russian military units and formations stationed in the European part of the country. It is these separate drills and exercises that provided the grounds for speculations in the West about the scale of the Zapad 2017 event, with some sources putting the number of troops involved at up to 100,000. As a matter of fact, Russia always holds drills and inspections at its military units every September to conclude the summer training period. That is why only those separate events that were part of the Zapad 2017 strategic drill plan can be legitimately regarded as part of Zapad – and those were few in number. In any event, even if those separate events are taken into account, they do not change the fact that the general thrust of Zapad 2017 was not about invading other countries, but rather about preventing such an invasion of Russia and its allies. On the whole, Zapad 2017 was a significant event because it offered a great opportunity to test the combat readiness of the Russian troops and command staff in the western theater, which is the most important theater of operations for Russia because that is where the NATO forces are deployed. NATO has a 15-fold superiority over Russia in terms of its combined military spending, and a five-fold superiority in troop numbers. The deployment of additional NATO forces in Poland and the Baltic states increases the level of threat facing Russia, because these forces are of course merely the forward component that could be bolstered by much larger reinforcements. Russia clearly needs to develop a set of measures to respond to that threat. Another Russian objective is to improve military coordination with Belarus, its ally in the Union State of Russia and Belarus. Zapad 2017 has demonstrated the growing differences between Russia and the West on European security issues. Those differences have already transcended the professional and political level, to become part of the social, cultural, and psychological plane. The rhetoric of official Western representatives and media outlets on the Zapad 2017 drills was based on deliberately ignoring inconvenient facts. It blatantly peddled prejudices, cultural, psychological and nationalistic stereotypes, and primitive propaganda tricks. The alarmist rhetoric was further fueled by several Eastern European nations and the Baltic states. It was quite clear that the eastern NATO allies were not genuinely concerned by the Zapad 2017 drills; rather, they merely used those drills as a pretext for scaremongering about the alleged Russian threat. These foreign and defense policy of these countries centers on their self-identification as a Western “cordon sanitaire” against Russia. They believe that by positioning themselves in such a way, they greatly increase their own value as allies of the West. That is why cultivating the idea of a Russian threat is an important element of the Eastern European nations’ foreign policy – an element that does not really require any provocation by Russia. In that sense, the Zapad 2017 drills have been a veritable boon for the Eastern European narrative. To secure greater Western assistance and cooperation, these countries are eager to provoke a deterioration in their relations with Russia, and then to incorporate that deterioration into the overall climate between Russia and the West. Their rhetoric on Zapad 2017 was a blatant attempt at such provocation. To conclude, Russia’s Zapad 2017 strategic military drills were not a contributing factor but rather a victim of the growing tensions between Russia and the West. Moscow’s attempts to reduce those tensions by limiting the scale of the drills, and by emphasizing their purely defensive scenario, proved fruitless. They found no appreciation in the West, where the drills were used as a propaganda instrument to peddle the idea of the “Russian threat”. This kind of situation can further erode mutual levels of restraint when it comes to holding large military drills on the European continent. Авто элегантно обошел проблему прикрытия белорусского плацдарма со стороны Балтийского направления.При проведение такого масштаба учений должны рассматриваться возможности ударов противника со стороны моря.Состояние ПВО ДКБФ,Калиниградского оборонительного района не способствует прикрытия флангов и тыла группировки,действующей на белорусском плацдарме по легенде учений. Выскакивает Чапаев ночью в исподнем на крыльцо, поглядел влево: "Ёб твою мать! ", вгляделся в темень справа: "Ёб твою мать!". Сзади из сеней Петька восхищенно: "Стратег!". для ленивых бы на паруска можна? Ещё и откуда-то берётся вывод, что мол раз освещение учений снизили - то и объём значит тоже. Отсев не владеющих самым распространенным иностранным языком. "а банальное не уважение к своему родному языку Иванов, не помнищих своего родства." С какого хрена Assault -- "охранная"? Это где так переводят? 98-я гвардейская воздушно-десантная дивизия. Не "охранная" и даже не "штурмовая". Перечисленные Вами соединения принимали участие в учениях будучи укомплектованными не в соответствии с требованиям частей постоянной готовности. -охранная -Guard - литературный перевод -гвардейская.